Sun Pharma’s acquisition of Ranbaxy Laboratories, in a landmark $4-billion transaction, marks the coming together of two major Indian pharmaceutical companies to create the world’s fifth-largest generic drug maker by sales. The all-share deal, the biggest in the pharmaceutical sector in the Asia Pacific region this year, is seen as a rare purchase of a local rival by a leading Indian company. While Sun Pharma is betting on Ranbaxy’s presence in India and emerging markets, it is also aiming to fix the existing factory glitches and uncover asset value in future from the Ranbaxy facilities currently barred from the US market. The buyout is valued at $3.2 billion, but Sun Pharma will also acquire Ranbaxy’s debt of around $800 million, taking the overall transaction value to $4 billion. Analysts and industry observers say it is a “fantastic” buyout for Sun Pharma, which is set to gain product portfolio, market and fixed-cost assets, from the synergy. Going forward, Sun Pharma might merge the Ranbaxy brand with its own to form a single entity. However, it is also open to creating a separate entity, as it did in its earlier acquisitions like that of Israel’s Taro Pharmaceuticals. After conclusion of the deal, Ranbaxy would eventually be delisted from Indian bourses, Sun Pharma promoter & Managing Director Dilip Shanghvi told Business Standard. “Ranbaxy will eventually be delisted. But we are in the process of understanding the implications and we will do a detailed country-wise analysis of Ranbaxy’s businesses. Right now, it is difficult to say whether we will maintain Ranbaxy as a separate brand or merge it. In our earlier acquisitions, we have often maintained multiple names. So we are open to that possibility as well,” Shanghvi said. 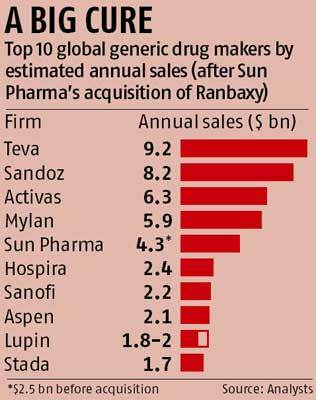 Under the terms of the agreed deal, Ranbaxy shareholders will get 0.8 Sun Pharma share for each Ranbaxy share held. The deal values each Ranbaxy share at Rs 457, representing a premium of 18 per cent to the 30-day volume-weighted average share price. Apart from helping Sun Pharma become India’s largest drug maker, the transaction also means a significant relief for Japan’s Daiichi-Sankyo, which has been struggling with Ranbaxy’s manufacturing and quality-related issues in the US, the largest pharmaceutical market. Daiichi-Sankyo had in 2008 acquired a 63.9 per cent stake in Ranbaxy for $4.2 billion. But the value of its investments has halved over the years, as Daiichi has not been able to restore compliance at Ranbaxy factories supplying to the US. When the deal closes, likely by the year-end, Daiichi-Sankyo will become a significant shareholder of Sun Pharma — a 8.9 per cent stake in the domestic company and the right to nominate one director to Sun Pharma’ s board. Ranbaxy’s underlying business had “robust growth” and profitability potential. 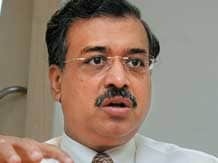 Based on that, the price Sun Pharma was paying for the deal was “justified”, Shanghvi told investors during a conference call earlier in the day. Sun Pharma plans to focus on remediation of compliance issues that had earlier led to bans at many of Ranbaxy’s plants. Currently, all four of Ranbaxy’s Indian facilities that were supplying to the US — Paonta Sahib (Himachal Pradesh), Dewas (Madhya Pradesh), Mohali (Punjab) and the active pharmaceutical ingredient (API) plant in Toansa — are banned from the market. Together, Ranbaxy and Sun Pharma will have operations in 65 countries, 47 manufacturing facilities across five continents, and a significant platform of specialty and generic products marketed globally, including 629 generic drug applications. Their combined revenue is estimated at $4.2 billion. Though its transaction with Sun Pharma immediately reflects a significant value erosion in Daiichi Sankyo’s investment in India, it might revive the Japanese firm’s India plans in the long term, if Sun Pharma is able to pull Ranbaxy factories out of the red in the near future.